Deutsche Bank analysed the recent Pew Research publication called "Pervasive Gloom About the World Economy" (which is quite informative). In particular DB looked at the past GDP vs. the surveys of current conditions as well as forecast GDP vs expected conditions. 1. 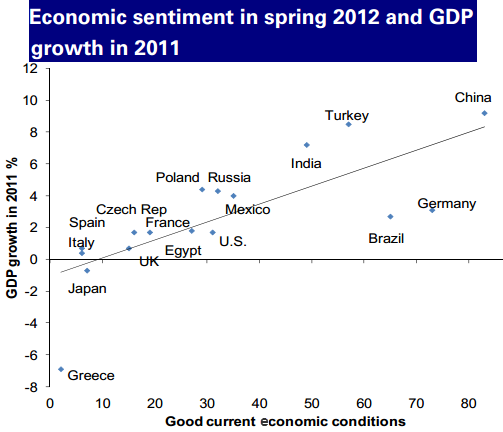 Sentiment surveys seem to correlate reasonably well with the actual growth as well as economic forecasts. 2. People of the Eurozone periphery seem to be well aware of their economic predicament. 3. Some emerging market nations, with younger populations and limited recent memories of recessions maybe too optimistic about future growth. 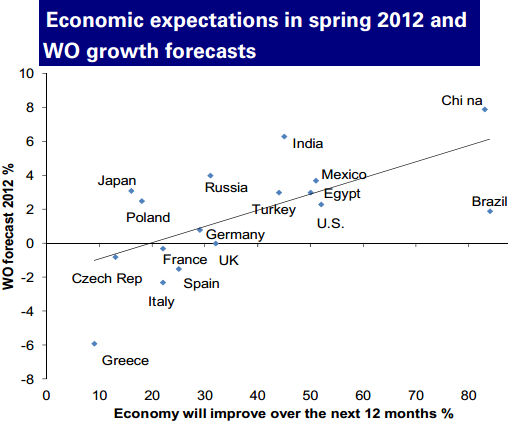 And by the way so is the DB's growth forecast for emerging markets (by their own admission). 4. Germans feel good about the nation's current conditions, which according to DB may allow Merkel to push through the necessary aid to the Eurozone periphery. DB: - Germans feel fairly confident about their country and themselves and seem willing to assist other countries in the context of Chancellor Merkel’s approach of help under strict policy conditionality. 5. But given the expectations of German growth grinding to a halt in the next 12 months, Merkel may not have much time.